Just finished my first in life "Instructable" at the D.I.Y. host site instructables. 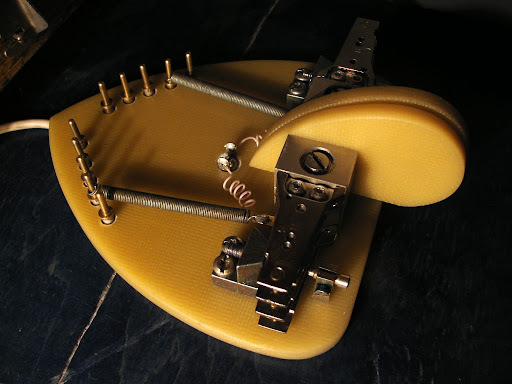 It is short sketch about Iambic Paddle which has been made using a spare parts from the dead MFM HDD drive. I got a lot of fun posting to that site, and I think that it should be good idea to post more detailed article here. Frankly, this homebrew project is not a Pure Glowing Bug, but I'm not so puristic today. Well, let me explain - why I decided to use HDD heads as a levers in this Iambic Paddle Project. For many years I've collected computer spare parts for no reason, just because I have a big, nearly endless Junk Box and it was impossible to me to throw such high-tech toys in the trash. But one morning I found that my Junk Box is full and The Time of Trash Bags has come. It was a hard work, but under the tons of debris I found the treasure - my first homemade Z80 Sinclair Spectrum and five old 5 inch MFM hard drives from my second computer.